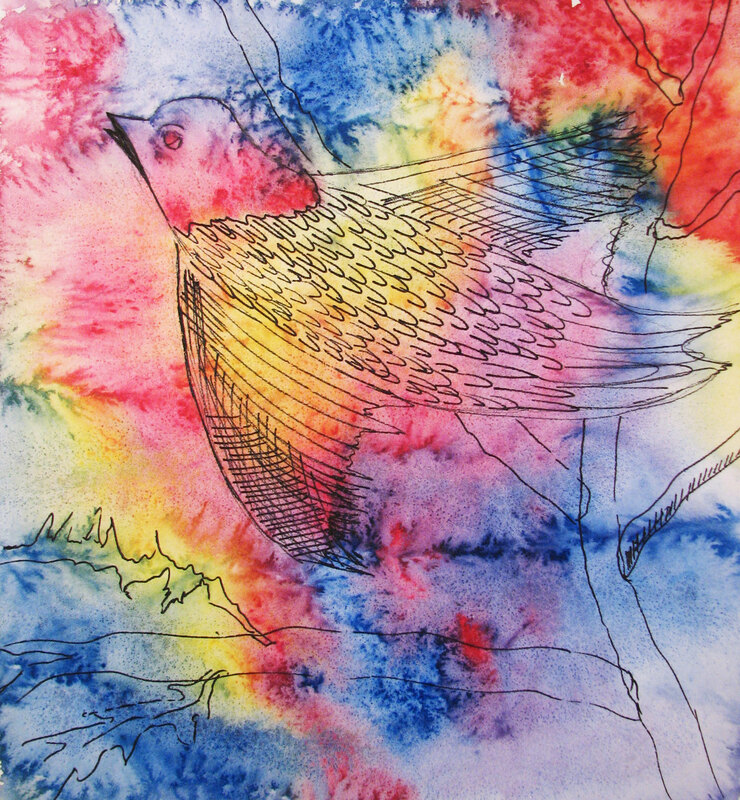 Students will be directed to observe the effect of wet on wet watercolor and ink. Students will create a happy accident painting using watercolor and ink [and/or markers]. Students will learn to appreciate the fact that mistakes are not always mistakes. Sometimes if you go with the flow, beautiful creations will result. Watercolor or other thick paper. Newspaper to cover work area. India ink or washable markers for younger students. Talk about mistakes and how artists often change a so-called mistake into something else. We call these “happy accidents”. Talk about watercolor paint and discuss the fact that it is a transparent paint. Compare watercolor paint with tissue paper — you can see through it and as more colors are layered atop one another, the more mixing and blending occurs. Review color mixing. Yellow and blue make green; Red and yellow make orange; Blue and red make Violet. Demonstrate how when wet yellow paint is added to wet red paint on the paper, and orange color will appear. Students should be encouraged to try mixing colors on the paper in this way. Students can then begin adding watercolor paint to their paper. The paint should be nice and wet so that it runs and blends on the paper. The entire paper should be filled with color. Students can pick up their papers and move them around to make the paint run in every direction. As the paint is drying, your kinderartists can begin to pick out shapes that appear on their paper. The shapes might be people or animals or plants … whatever they see. These shapes can be enhanced by adding black ink lines (either with a marker for the younger kids or with a Shish kabob stick dipped into ink for the older kids). The ink will run in the areas that wet — this is encouraged. When complete, discuss the results with your students. What shapes and images did they find in their paintings. Were they surprised at finding all the wonderful shapes?